A lot of changes have been happening on Facebook. One of the more surprising things I noticed was that the entire Info tab of my profile is now nothing but a giant link list to Facebook Fan Pages. I mean, I may be interested in cheeseburgers, but that doesn’t mean I want to join the Facebook Fan Page. If they already coerced you into adding these Pages – like A LOT of people have been – here is the quickest way to delete them. The last time I logged in to Facebook and visited my info tab I noticed that Facebook was prompting me to link my profile to a list of Facebook Pages. Every single Interest, Book, Movie, Music, and even my professional and hometown information list as possible Pages. Pages are Public, and so that means if I went ahead and linked my account to all these Pages matching my info, that it would be available for ANYONE to see. An “improvement?” Hardly. With that said, and since there wasn’t a “No” option, I opted for the Ask me later button. Guess what happened? 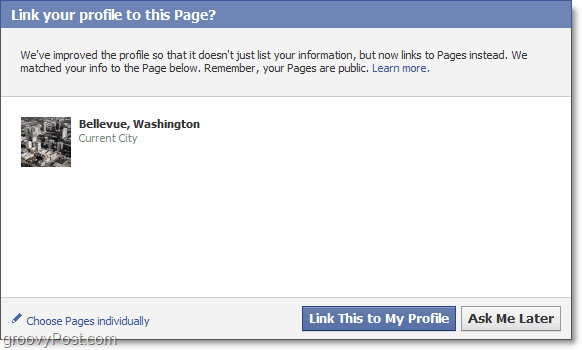 If you try to avoid linking your profile to this page, Facebook will instead just go ahead and Delete nearly EVERYTHING from your Info tab. Here they are forcing you to link your profile (and all of its information) to Pages if you want to list anything about yourself; so much for privacy. But what exactly is a Facebook Page? So what is a Facebook Page? So unless you block your friend’s applications (very time-consuming), they will be able to access all of your personal details and photos as well. But wait – Applications used by Pages can access your information as well, but in their case, there is no way to block them. Ready to remove Facebook Pages? You might lose your list of interests and other items on your Info Tab, but here is the how-to. 1. 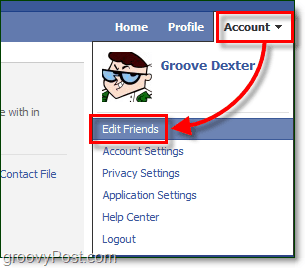 At the top-right of Facebook Click Account and Select Edit Friends. 2. Now once the new page loads, on the LEFT sidebar under Lists, Click Pages. 3. Once the Pages window loads, you’ll see a list of all of your Pages. While you have the ability to add pages at a whim, when it comes to deleting them it’s a different story. You have to manually Click the X for each page, and then confirm each deletion. 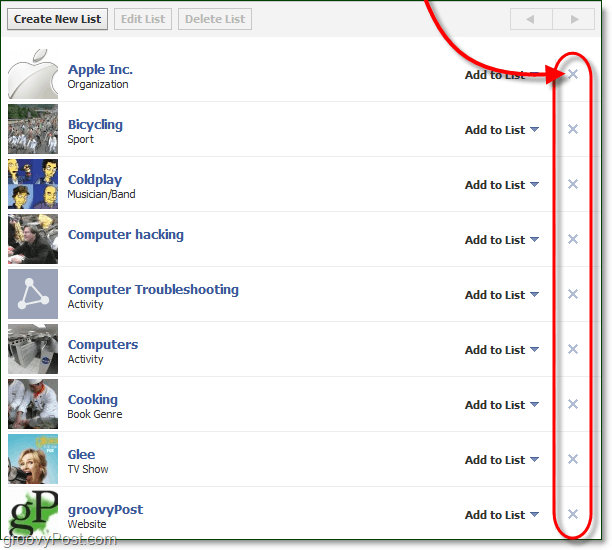 Where’s the bulk “delete all” Page removal feature Facebook? Manually deleting each page is going to take a while, especially if you have 100’s or like some people, thousands of Facebook pages attached to your account. This volume of work might seem hopeless, and it certainly could be, but there is one small trick to make it go faster. 4. Save Time. Once you Click the X that signals a deletion, the confirmation window will appear. Rather than wasting your mouse away with time-consuming clicks, just Press the Enter button on your keyboard. Luckily Facebook left Remove as the default when you press Enter, so you can quickly go through a lot of Page deletions by rapidly clicking X and spamming the Enter key. So again, Facebook has made it incredibly difficult to maintain your privacy and even gone as far as to force you to link your profile to public Pages. Really?? With the current look of things, the only way to guarantee that your personal information isn’t stolen, sold, and used is to Permanently Delete Your Facebook Account. Sorry Facebook, you’ve left us no choice. Thank you so much for this information, new facebook changes have made it impossible for me to figure out how to do ANYTHING. This no longer works…there is no access to the page that lists the “likes or fan pages” under Edit Friends. I tried removing some “likes” but some of them took me to a different website, so they pretty much mislead you to liking something and then changed it to their benefit, and they have no “remove like” button. Some “remove like” buttons don’t even work! So how do we fix this problem now? Facebook is getting so damn annoying, no wonder I keep hearing my friends say they are going to get out of it. Anyone have any suggestions as to how to remove an “like” that has changed into a new website? Click “Edit Page” underneath the profile picture when viewing your Page. Select “Manage Permissions” from the left sidebar. Click “Permanently delete this Page.” Please keep in mind that once you delete your Page, there’s no way to reinstate it. OK so I’m logged in to facebook and looking at my “wall” then I navigate around to see other friends pictures and status updates then go back to my profile page and my picture has changed and my status update reverted back to the one from the night before and now all my friends pages say “add as friend” (they already are friends). So then I delete cookie, cache log back in and it says “account already confirmed” what’s up with all that??? Maybe you can help because the good people at facebook never seem to address anything you write to them on their help page. I CANNOT FIND IT ANYWHERE!! How about my new facebook ? I am DESPERATE to get rid of a huge number of these interest groups and have tried to get a comprehensive list – to no avail. I tried to find the place to do it according to your directions but it’s no longer there. Where can I find a total list? I’ve tried at the top left of my profile page, where I can get a list of my interest groups – but even when I click to get more it still is just a fraction of what I have joined over the years since I started on Facebook. Then I tried via the top right of my home page where you edit your profile and click on ‘activities and interests’. Again it only brought up a fraction of them. Can you please tell me how I can get a comprehensive list. This is driving me crazy! Ok, I figured out how to do this (I’m not using the new timeline so I don’t know if it’s the same). 1. CLICK on your name either in the right corner or your name next to your profile picture. 2. ON THE TOP RIGHT corner, CLICK on –> Edit Profle. 3. In the left column, CLICK on –> Activities and Interest. 4. You can delete all your activities. However you do have to do them one by one. 5. SCROLL down to the very bottom of page. 6. CLICK on –> Other Pages you Like (this is below the SAVE CHANGES button in little blue letter. 7. It will bring up all the pages that you LIKED and want to UNLIKE. Again, must be done one at a time. Thanks for your response. I had already done this though and it still hadn’t brought up all my lists – even when I clicked on ‘other pages you like’. However, for some odd reason I’ve been able to add lots of new groups recently without deleting any more. I had deleted as many as I could find that I didn’t care about – but even so, I am sure I must be past the quota they had set – so I don’t know whether they have increased that quota recently or whether they have cleaned out a lot of old groups, which has automatically decreased the number on my file. I just can’t seem to find a way of accessing ALL my groups. This is annoying but I can’t be bothered wasting any more time on the issue unless I again reach the point where they won’t let me add any new groups. It’s really no wonder problems like this occur when they keep making such massive changes to Facebook – there’s sure to be some features that ‘fall through the cracks’ so to speak. very good, it’s very useful to me, thank you very much! 2: Scroll all the way down till you see “About . Advertising . Create a Pages ….”, they are grayed out and small, so look carefully. 5: There you will see all the pages, to right there are “liked” buttons, just hover you mouse button over the “liked” button, a small popup will shows up, you can then click on”unlike” to remove any page you want to get rid of. * it may take a while for the popup to comes out, or try to click on the “liked” bottom. FB changes all the time. This is an old thread. There is no account in the top right-hand corner anymore. It does not say Home, Profile, Account. I’m trying to remove the interest page which I never added in the first place: Home, Profile, Account, and then Select Edit Friends, Pages. I have none of those because I can’t even locate the account anymore. When I go to Settings, half the stuff you can’t change at all. For instance: Can’t turn off the app requests and activity. When I click on Edit, it Says ON and there is no toggle link to shut it off. So does anyone know how to use the new FB to remove the “interest pages” and turn off the “app requests and activity, which I also never added. I’m finding FB more frustrating than it’s worth. there is no account button on my page. No edit button. Other sites say to go to settings and select “remove page” which also doesn’t exist. WTH?